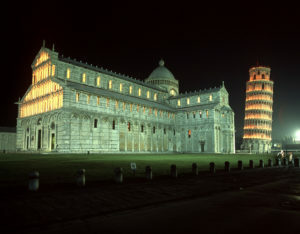 Both the Leaning Tower of Pisa and Camposanto, two major monuments of Pisa’s Piazza del Miracoli, will have extended hours during the height of the summer season in Tuscany. Through August 31, these landmarks with remain open until 10 pm. This decision is to complement tourist demands, to make it more accessible for the influx of visitors. The Leaning Tower of Pisa tests the nature of physics with each passing minute, as it slowly inclines day by day. In 1298, an architect calculated its inclination to be at 1 meter and 43 cm (nearly 5 ft), and a recent measurement shows it to be at 5 meters and 42 cm (18 ft). Because Leaning Tower is continually shifting, the top 293 steps are declared unsafe, and the public is not allowed climb past that. As the unique beauty of the Piazza, the mystery of its architectural structure is also at the basis of its world-renowned reputation. The Camposanto, a medieval cemetery that has been restored after World War II raids, contains a collection of sculptures and paintings, including frescos by Italian masters of the 14th and 15th centuries. The builders were inspired to create both a burial site, as well as a center to teach the value of eternal life. Bombing, atmospheric conditions and lack of maintenance have caused the paintings to seriously deteriorate. To bring the art back as closely as possible to its original splendor, an innovative system of restoration has been introduced. When lit at night, The Camposanto glows like a lantern. It is a mystical wonder of a museum.